Over lunch the other day, a Chinese vendor passed me a fat-looking USB drive with a gleam of excitement in his eye – USB drives have been around for a while, so what’s the big deal with this one, I asked? A slightly-garbled translation led to the revelation that this one, called ThunderDisk, has a mSATA Solid State Disk (SSD) buried inside it’s metal shell. 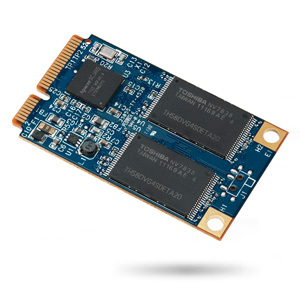 mSATA SSDs are typically used by ultra-thin notebooks, and some small desktop PCs such as the Intel NUC (Next Unit of Computing). They are very quick, compared to regular spinning disks, and are where a lot of near-term consumer PC storage is moving to. I’ve pictured it below, sandwiched between regular 2.5inch Lacie USB external disk, and a Corsair Voyager thumb drive. The Thunderdisk comes in 128GB and 256GB capacities, has a detachable standard USB3.0 Male ->Micro USB3.0 cable, around 10cm long, and came with a felt carry bag. It looked pretty-well sealed (no visible screws or clips) so I was loath to break it open – querying the hardware revealed it has an ASMedia USB Bridge controller, and from chatting to someone who was brave enough to pry it apart, a JMicron mSATA controller. There’s a tiny little LED on it that blinks for drive access, and is coloured according to the type of USB speed it’s detected. The cable will plug into, and work with, USB2.0 and USB3.0 ports. It purports to work with Apple Macs too, although I’ve none here to test with. By combining the barely-measurable access time and super-fast transfer rate of over 400MB/sec of SSDs with SuperSpeed USB3.0, you apparently end up with a tiny portable drive that’s as fast as any bleeding-edge SSD you’d install in a PC, for not much more money than a bare SSD itself. Now, I’m interested, given the possibilities a super-fast / cheap external disk might offer, so read on if you are too. Vendors from the Far East are often, not to put a too-fine point on it, inventive with their specs, so after installing Win8 to it (detailed below) I jammed this into a desktop PC’s USB3.0 port (Intel B85M chipset-based board), and got Atto benchmark results not too far from the average bleeding-edge desktop SSD – that’s not too shabby, considering that the Thunderdisk was the running Windows drive as well, which normally would impose some overhead. A few years ago, this result would have been unachievable. For comparison, both the Lacie and Corsair drives will max out well below 100mb/sec, against the 400+MB/Sec the Thunderdisk can do, on USB3.0. 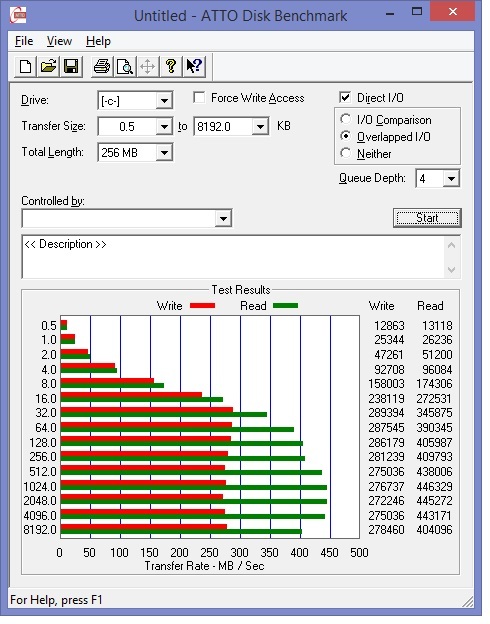 The vendor claimed 460MB/sec read, surprisingly close to the result above obtained whilst running Win8 on a Z97-chipset board with Samsung Evo SSD as the Windows drive. No drivers were requested, the hardware is auto-detected. USB2.0 speeds top out at 30MB/Sec for all of them, for that’s the speed limit of the USB2.0 standard. Further testing with the ThunderDisk running as a slave drive on an older P67-based system with ASMedia USB3.0 chipset showed transfer rates in the 250-350Mb/Sec range, as the benchmark may be hitting some bottleneck in throughput from SATA to USB via the PCI-E lanes. One of the big deals they mention is that you can use one to run your own copy of Windows on any recent PC that supports booting from USB2 or USB3. By using a free O/S installation tool (Win2USB seems to be the popular choice), you can install a copy of Windows 7 or 8 to the ThunderDisk, and it’ll be just as fast as your own PC wherever you go. And of course, it’s a regular USB drive too, so you can use it to copy large files, eg movies, at 10x the speed of many cheap thumbdrives. It’s blurb says it also works with WindowsToGo, using Windows 8.1 Enterprise, although the Win2USB method seems to be doable with a whole lot less stuffing around, seeing as WinEnterprise, being aimed at Enterprise folks, is not something you can just buy as a a regular bloke. 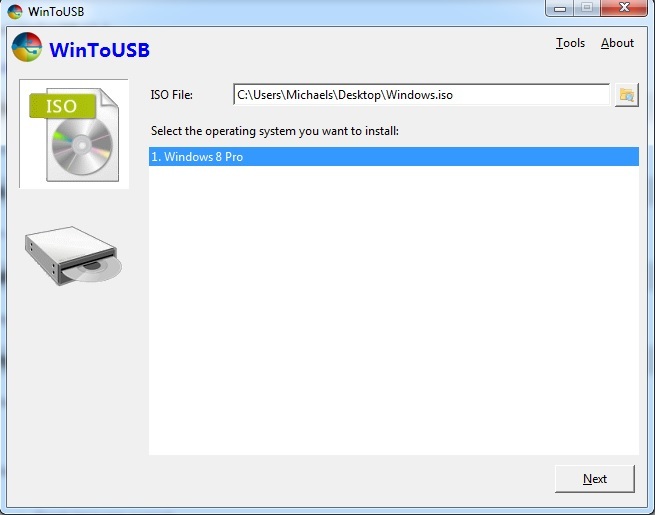 Win2USB is a sub-3mb download, and has a super-simple interface that lets you choose your Windows image (I used a purchased Windows8 download from MS, or you could make an ISO file from a Window DVD), and then pick the USB ThunderDisk as the destination, and that’s all you need to do to make it ready to install – just reboot the PC, watch for the motherboard’s prompt to choose a boot device, pick the Thunderdisk from the list and from there it’s a default Windows install. I had a good reason to use a Thunderdisk in a hotel in Taiwan recently – they had a bunch of crappy PCs in the lobby for guests to use, but all were running Chinese-language Windows, and who knows what kinds of spyware and firewall snoops they would be running – I reset one of them, stuck in the Thunderdisk, and waited for about 30 seconds for it to detect all the hardware, and reboot. The second time it booted to my own clean Win8 install. I can imagine another neat use for this – if you are presented with a malware-infested PC to repair, how do you fix it when the really-persistent scamware hides in the boot block, covers the screen, or disables the browser? Plug in the Thunderdisk, boot the shabby PC with your own clean Windows, and run Malwarebytes / your anti-virus of choice against their disk, which won’t have any of the malware / viruses running and able to defend themselves from your fix. I’ve tested the ThunderDisk on a bunch of PCs up to 4 years old in our office – my Win8.1 install found the hardware every time, and was usable within 1 reboot, with USB3-port-performance indistinguishable from a regular internally-connected SATA SSD. USB2.0 performance is slower, but still very usable – way more responsive than a spinning disk, due to the faster access time, I’d say. Part of this comes down to 4K file transfer performance, and the Thunderdisk is pretty good at it – more info on why this matters is bantered-about here. It goes without saying that copying larger files, such as, Ahem, movies, is super-fast, like a gigabyte-every-3-seconds fast. 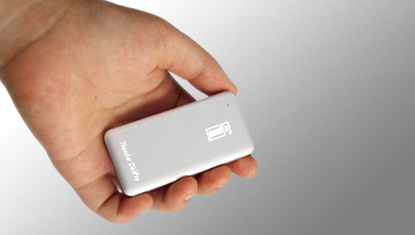 As of writing this, the ThunderDisk 128GB version ships for under $150 AUD, and the 256Gb version under $240 AUD. That’s a little more than a decent-brand 2.5inch SSD. Corsair are bringing out their mSATA-based USB drives next week, but at around $170 AUD for 128Gb and $300+ AUD for 256GB, they are a fair whack more dough than the ThunderDisk. Alternatively, you can grab a 128GB Sandisk Thumbdrive for under $100 AUD, but that’ll be 10x slower at least, and in no way suitable for installing an O/S to. My only gripe with the ThunderDisk is that the USB3.0 cable is pretty short, which comes down to cost-cutting I’d guess, given the profit margins for manufacturers of storage gear are small enough that they usually require a microscope to resolve. Luckily, it’s not a proprietary cable, so you could replace it easily enough with a longer one if you didn’t want to crawl under your desk to use it. 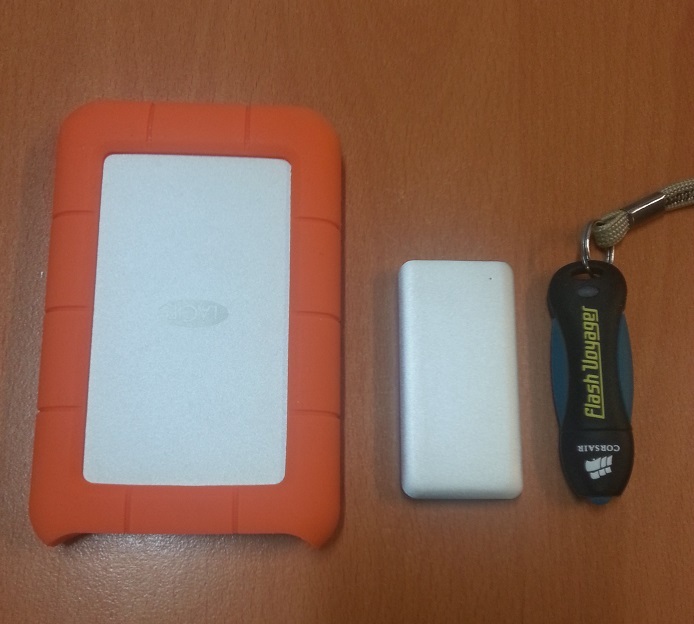 I’m going to keep the 128gb one handy in my bag of tools…. This entry was posted on August 19, 2014, 10:16 am and is filed under Storage. You can follow any responses to this entry through RSS 2.0. You can leave a response, or trackback from your own site.